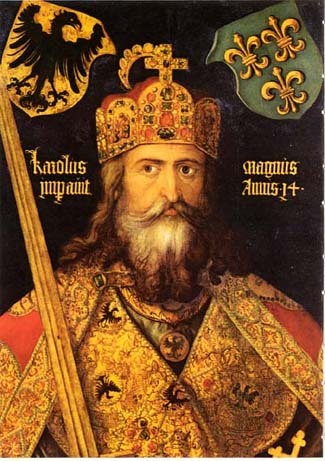 The English name Charlemagne comes from the Latin Carolus Magnus, which means Charles the Great. Hence the medieval French Charlemagne, which was adopted also in the English language. In 772, the 30-year-old Charles took over the government of the whole Frankish Kingdom. With reason he is called Magnus: he earned the title as general and conqueror, as the man who put order into his immense Empire and as a legislator, and also as one who reformed and stimulated the spiritual life of the West. By means of his government, Christian ideas were victorious over the barbarian peoples. His life was a constant struggle against the rudeness and barbarism that threatened the Catholic Religion and the burgeoning new culture. He led no less than 53 wars: 18 against the Saxons, one against Aquitaine, five against the Lombards, seven against the Arabs in Spain, one against the Turungians, four against the Avars, two against the Bretons, one against the Bavarians, four against the Slavs, five against the Saracens in Italy, three against the Danish, and two against the Greeks. On Christmas in the year 800 Pope St. Leo III raised him to the dignity of Emperor, founding by such act the noblest temporal institution of Christendom, which was the Holy Roman Empire. On February 28, 814 Charlemagne died, after having received the Holy Eucharist. He was buried in a niche of the Basilica of Aachen (in Latin, Aquisgranen; in French, Aix-la-Chapelle.) According to the legend, he was buried seated on his throne in upright position, wearing his sword and with the book of Gospels in his hands. He became the model of Catholic Emperors, the prototype of the cavalier, and the central figure of most of the medieval Chansons de Geste.